I'll be riding mine too. Haven't gotten out sine the leaves started to fall. Has nothing to do with the bike. If I had a convertible I wouldn't be riding in it top down either. Oh come on now Thomas. 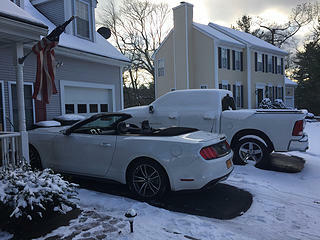 My rental outside my place in Rhode Island! LOL. Ya got a convertible, the top should be down! Tom is getting SOFT in his old age. LOL. 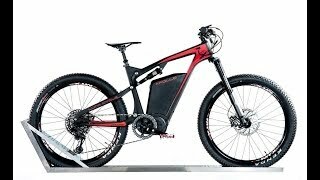 Hey lets e-bike up the middle fork this summer and hike into Williams lake. I just rode mine down to the other end of town to pick up muh pickup. Although the streets were packed snow this morning, they have mostly melted--I rode over 2 snow patches. It had warmed up to 44 degrees, almost shorts weather. Mechanics like to look at yer e-bike and ask questions. The constant unanswerable question is How Many Miles Do You Get Before Yer Battery Runs Out? I patiently explain all the variables. We discussed what it will take to ride to Conconully and back. I plan to find out in warmer weather. It looks like Luna Cycle finally released the Apollo last week. Nice looking bike with a lofty price tag. Seems they are already sold out of the first batch.